This audio description has been compiled by Joe Turnbull in February 2017. It was commissioned by Disability Arts Online on behalf of NDACA (the National Disability Arts Collection and Archive). It is approximately 7 minutes 40 seconds long. In the top left of the film still, is a rectangular box with the words Freaks Out. Freaks appears in black text in the white top half of the box, Out appears inverted in white text on the black bottom half ). Underneath black lower case text reads ‘A Season on Disability and Cinema.’ In the bottom-right smaller text written vertically credits the image ‘Photo: Freak Out’. Freak Out received a large amount of mainstream press attention, with major features written about it in both The Times and the Guardian. It tripled viewing figures for its post-watershed timeslot. 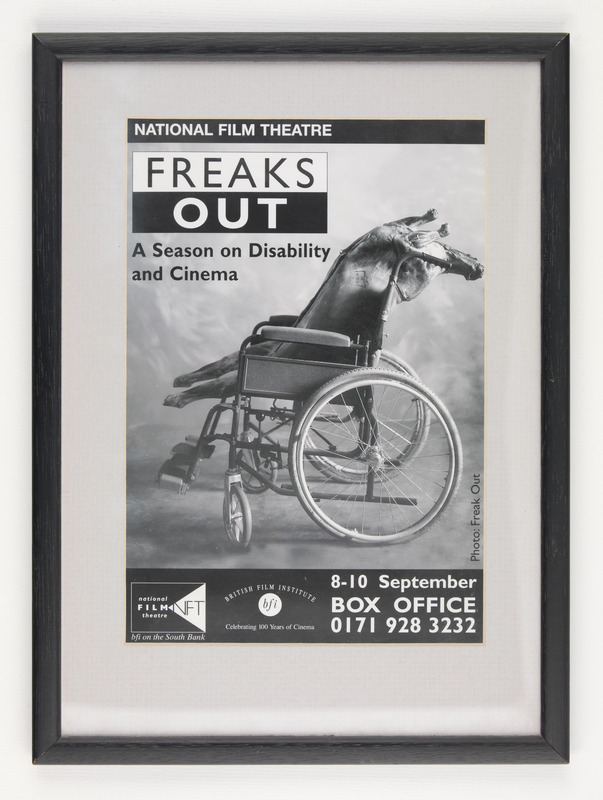 Buoyed by the reception of Freak Out, the British Film Institute (then the National Film Theatre) programmed a season of disability cinema in September 1996, borrowing the name from the film. Little information is available about the BFI programme.